A few short weeks ago, Urban Melbourne highlighted South Yarra’s steamrolling ability to continually accommodate new residential apartment projects. Latest cab off the rank is Claremont Manor, which has seen a slew of new images and information released in preparation for sales. Although the display suite adjoining the site at 3-9 Claremont Street suite has yet to been completed, the project was highlighted as part of the Melbourne Property Expo Event held in Singapore over the weekend. Described by lead architect Bird de la Coeur as two interlocking black and white towers that contrast against one another, the two buildings will host 318 apartments, commercial and retail spaces over 20 levels. The project is the latest from Southlink Developments and according to their website, represents the largest of the firm’s current batch of projects. Claremont Manor may be the forefront at the queue of South Yarra apartment towers, but it’s far from the largest. Earlier this year, 661 Chapel Street gained planning approval following ministerial intervention by Matthew Guy in conjunction with the Minister for Education. First highlighted in May last year, 661 Chapel Street’s form has changed markedly from the initial design dual designs put forth for approval. Dual in that the initial application included a second altered design, which seeded part of the site to Melbourne High School for a potential five level mixed-use facility, which has since been seeking planning approval separately. Subsequently 661 Chapel has grown in overall height to near on 94 metres while the tower’s frontage to Chapel Street has decreased, presumably in an effort to maintain a similar built wall height of approximately 50 metres to neighbouring towers such as Avenue and Olsen Hotel. Controlled by developer Michael L Yates & Co and created once more by Bird de la Coeur, the 261 apartment building is likely the prolific developer’s next project due for release, following the success of Yarra House which is now under construction. 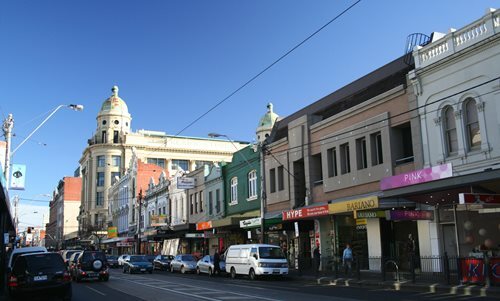 Not to be outdone is LK Property Group, which according to varying media outlets is the new owner of the Fun Factory/Capitol Bakeries super site fronting Toorak Road and Chapel Street. Holding approval for a Bates Smart-designed 136 metre residential tower, it’s uncertain if the developer will proceed with the rejigged 486-apartment giant seen below or pursue another scheme. Based on the strong sales of LK Property’s current notable residential projects, Gisele and The Opus Tower, it’s not outlandish to suggest that after 25 years of failed attempts to develop the prime site, its time is nearly upon us. This article was orginally published by Urban Melbourne.